The Indigo Quill: I Was Nominated for 2 Liebster Awards!! 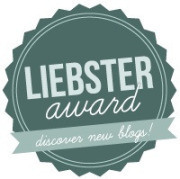 I Was Nominated for 2 Liebster Awards!! Wow!! So not only was I nominated for my first blog award this week, I was nominated for it TWICE! Thank you, Shannah @ Book Reviews by Shannah and Laura @ Crafty Booksheeps! I am so honored that you would choose The Indigo Quill for this award! - Link back the blogger that tagged you. - Nominate ten others and answer the questions of the one who tagged you. - Ask ten questions for the bloggers you nominate. - Let your nominees know of their awards and tag backs. I always loved Karen Kingsbury and her ability to use her stories to change lives. They are inspirational and she is so real with her writing! 2. What made you want to become a blogger? I've been a blogger ever since we got dial-up in the 4th grade (Open Diary, anyone?). But I have always had this desire to start a book review blog and finally did it earlier this year, boy am I glad!! Redeeming Love by Francine Rivers. Such a beautiful book!! 4. What would be your ideal vacation spot? In a cabin buried deep in nature somewhere. 5. If you had to choose, what would you do: Read or Write? That's a tough one..probably read. I really love reading! 6. What is your favorite spot to read? The park. I really love being outside! 7. Which blogger has been your biggest inspiration? Umm..I was first introduced to this stuff by Sarah @ I'm Loving Books. So I think I'd have to say her. 8. If you could choose any person in the world to spend the day with, who would it be? J.K. Rowling. I bet it would be absolutely magical. 9. What are your other hobbies (besides reading)? I spend my time doing music, whether it's Worship Team at my church or practicing for my major. I also like making things. I've been upcycling a lot to decorate our house...I love watching The Junk Gypsies! 10. What inspires you daily? Knowing that I serve a much bigger purpose than what I simply see in front of me. Question Set #2 from Laura @ Crafty Booksheeps! 1. Who is your favorite author (s) and why? 2. What do you enjoy most about blogging and would you recommend it to others? I enjoy the community of it, and being able to share something I love with others and vise versa. As long as you understand the pure joy of it, then yes I would recommend it. 3. Is there a book you didn’t think you’d like, but you ended up loving it? The "Barbie Girl"/"Barbie World" books by Heidi Acosta. Totally exceeded my expectations!! 4. What would be your ideal vacation spot or your dream vacation? I kind of answered this in the last set but I'll pick a different one..I've always wanted to go stay at the Enchanted Manor on the Isle of Wight that portrays many of Josephine Wall's artwork. 5. How many books are on your TBR shelf? Oh dear...waaaaay too many!!! Hundreds. 7. Do you have a favorite snack while reading? I have this serious thing for chips and homemade salsa. 8. Which blogger has inspired you the most? As previously stated, music & crafting! 10. What’s one of your biggest book pet peeves? 2. How long have you been book blogging? 3. What is the one book you think everyone needs to read? Why? 4. Hardcover, paperback, or eBook? 5. Who has been your blogger-inspiration? 6. Name 3 things you enjoy doing other than reading. 7. If you could own an entire series, which one would it be? 8. Coffee, tea, or something else while reading? 9. What is your favorite movie adaptation of a book? 10. Which book are you looking forward to coming out in the near future? I KNOW! They REALLY need to make that book into a movie. congrats on the awards.new GFC follower here.